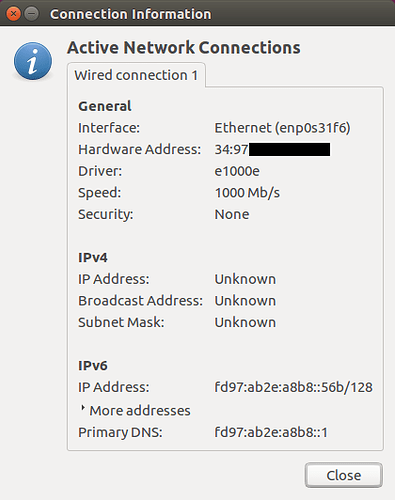 I’m running the latest 3.8.5 and after restarting, the router will only assign IPv6 addresses to all devices on my LAN. Now none of these devices have any internet connectivity, despite being previously assigned static IPv4 addresses. I’m unable to connect to the Omnia to troubleshoot or administer it, all I can try is resetting it and after several attempts IPv4 connectivity still fails. What are my options now please? Two Ubuntu machines show this connection info, and an Android device simply times out after trying to connect to WiFi after a while. All were working perfectly just before the restart of the Omnia. EDIT: Similar problems here (“Client not receiving a new IPv4 address after router reboot”) and here (“DHCP/Network up seems to be flaky”) and the suggestions to restart, switch Ethernet ports, or restart the network manager on the connected devices does not resolve the bug. IPv6 address from fc00::/7 isn’t really usable either (i.e. only within LAN). Nothing on the router LAN is usable right now, route -n produces no output. I’m using a tethered mobile for connectivity and hoping to resolve this soon. I just tried the “Rollback to latest snapshot” reset option and after restarting it’s still broken. It seems like dnsmasq isn’t running, usually that is case when it tries to listen on port 53 which is occupied with kresd/unbound. Thanks, I am able to ssh to the router using your instructions however this didn’t resolve the problem yet. uci show dhcp. @dnsmasq.port='0' returns dhcp.cfg02411c.port='53', so it appears you are correct that it is using port 53. Is there a way to troubleshoot this further, and to prevent this from happening again? I note I am using Pi-hole in an lxc container on the Omnia as my DNS server. message. Running a very similar setup, and only getting IPV6 addresses which are less then usefull. How do I get my connection back up and running?? ?